James J. Stakem, a Democrat, was first elected to the Board of Allegany County Commissioners in 1998. He was re-elected to a second four-year term in 2002, and was re-elected a third time in 2006. The door hanger depicted here, with his slogan, “A True Representative for All of Allegany County” is from that campaign. Stakem’s campaign treasurer was Phil Davis. Jim Stakem lost his bid for re-election to County Commissioner in the September 14, 2010 Democratic primary. William “Bill” Davis (1932-2014), a Republican, was first appointed to the Frostburg City Council in 1967. He ran unsuccessfully for Mayor in 1972 and, as noted on the card depicted here, provided a phone number for a free ride to the polls. He was elected to the city council in 1976 and was re-elected in 1978. In 1980, Bill Davis was elected to the first of his three two-year terms as Mayor of Frostburg, serving in that capacity until 1986. It was also in that year Davis made an unsuccessful bid for election to the Maryland House of Delegates. Bill’s wife, Winifred, is one of only four women to have been elected to serve on the Frostburg City Council, this being from 1990-1992, and three consecutive terms from 1994-2000. David Goad , a Democrat, joined the Allegany County Sheriff’s Department in 1978 and was elected Sheriff of Allegany County in 1994. Goad has been re-elected to that position in 1998, 2002, and again in 2006. Goad did not seek re-election in 2010. Bill Valentine was among the three Republicans elected to the Board of Allegany County Commissioners in the November 2, 2010 General Election. Amel Morris was elected to the Westernport City Council in 2006 and served as Finance Commissioner. In May 2008, Morris was elected to serve a two-year term of office as Westernport's Mayor. Morris chose not to seek re-election. W. “Jack” Sowers and George B. “Husky” Staup, a Republican who served sixteen years as a Deputy Sheriff, were both unsuccessful candidates for the office of Allegany County Sheriff. Paul C. Haberlein, a Republican, was sworn in as a Deputy under Sheriff Edward R. Muir in 1954 and 1958. In 1959 Haberlein was recommended and subsequently appointed to serve as Sheriff upon the 1958 resignation of Muir due to ill health. Edward R. Muir, a Republican, had been elected Sheriff in 1946, 1950, 1953, and 1958. Haberlein served as Sheriff of Allegany County from 1959 through 1970. William E. "Scotty" Orr, a Republican, served as a Deputy under Sheriff Edward R. Muir in 1946 and 1950. He again served as a Deputy under Sheriff Paul C. Haberlein in 1959 and 1962. Orr would be elected Sheriff of Allegany County in 1970, serving through 1974 when he was defeated by Donald R.Wade. Orr would again run for Sheriff, unsuccessfully, in 1978. George B. Staup, a Republican, served as a Deputy under Sheriff Muir in 1954 and 1958. He also served as a Deputy under Sheriff Haberlein in 1962. Staup ran in the Republican primary for Sheriff in 1970, but lost, to "Scotty" Orr. Lawrence R. Maiers and Lewis Edward Tyree, both Republicans, sought the office of Allegany County Sheriff in 1974. Tyree had previously served as a Deputy in 1962 under Sheriff Paul Haberlein. 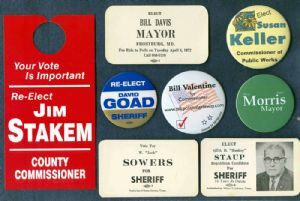 The 1974 campaign ended with the General Election of Francis "Jake" Michaels, a Democrat, as Sheriff. Donald R. Wade, a Republican, defeated William "Scotty" Orr in the 1978 Republican Primary, and went onto defeat Francis "Jake" Michaels in the 1978 General Election. Wade would again defeat Michaels in 1986. Wade served as Sheriff of Allegany County from 1978 through 1990 when he declined to run for re-election. Gary W. Simpson, a Republican, served as a Deputy under Donald Wade in 1986. He was elected Sheriff in 1990 but was defeated in the 1994 General Election by David Goad, a Democrat. David Goad, a Democrat, served as a Deputy under "Jake" Michaels in 1978, Sheriff Donald Wade, a Republican, in 1982, and Sheriff Gary Simpson, a Republican, in 1990. Goad went onto to serve as Sheriff from 1994 through 2010. Frederick N. Fadley, Jr., a Republican, served as a Deputy in 1978 under Sheriff Francis "Jake" Michaels, and again under Sheriff Donald Wade in 1982. In 1990 and again in 1994 he ran for Sheriff in the Republican Primary but lost to Gary Simpson. Fadley again ran for Sheriff in the 2010 Republican Primary, but lost to Craig Robertson. Craig A. Robertson, a Republican, served as a Deputy under both Sheriffs Donald Wade and Gary Simpson in 1990, and Sheriff Goad in 1994, 2002, and 2006. He was elected Sheriff in 2010, and re-elected to that office in 2014.